The application process for the 2019-2010 school year is closed. We will announce the scholarship winners in a couple of months. The following Anne Lowe Scholarship recipients are listed in alpha order by last name. Jamian Phillips was a star high school athlete and model citizen in Dallas, Texas. He will be going to college this fall and plans to study business electronics. For a couple of summers he has volunteered for a nonprofit organization that works with inner-city children, providing them with breakfast and lunch, and activities while their parents are at work during the day. Phillips said that he found the work very rewarding. Of his vision loss he said that he will embrace his disability and not fear it. Nor, he said, will he allow it get in the way of his success. 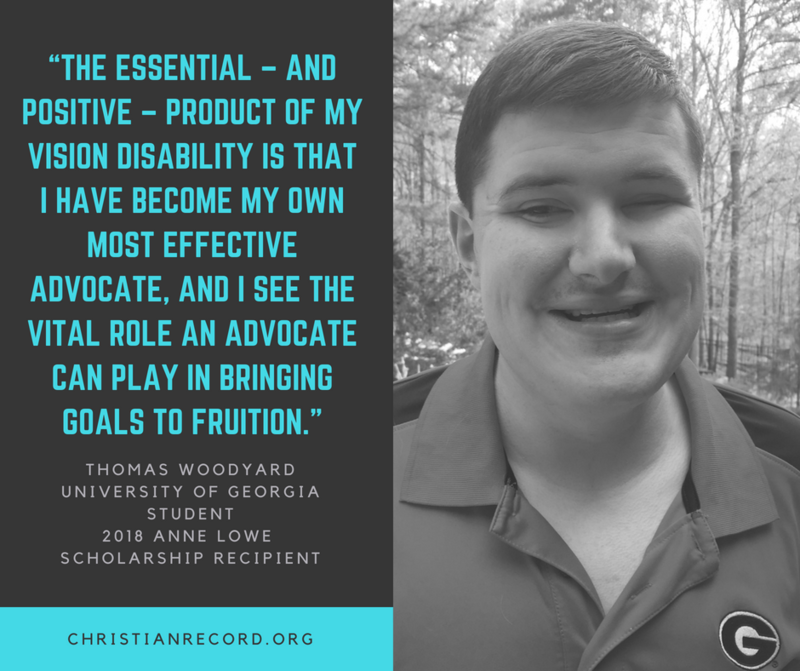 Thomas Woodyard is an International Affairs major at the University of Georgia, Atlanta. His ultimate goal is to obtain a Juris Doctor. Toward that goal he has traveled to Oxford, England, for study abroad classes in international law studies. He was the first legally blind student in 25 years to participate in Florida State University’s College of Law Summer for Undergraduates in which students took legal writing courses and participated in mock trial simulations. Woodyard is also part of the National Federation of the Blind Pearson Changing the Channel Legal Mentorship program. 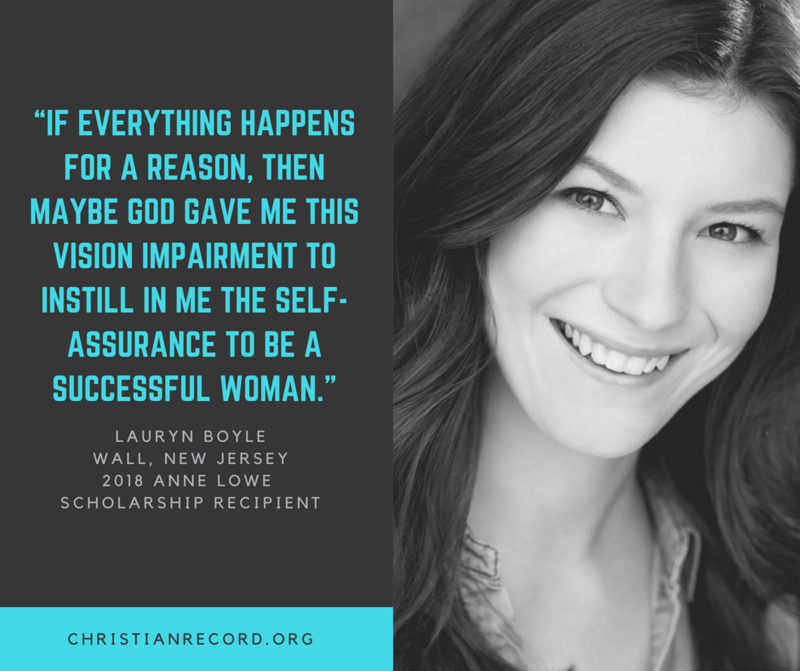 The Anne Lowe Scholarship is awarded to college students and is based on academic achievement, citizenship which is supported through reference letters, and verification of blindness. The scholarship is distributed in two parts during the school year. Tom Lowe established the scholarship in 1989 in the memory of his wife, Anne, who loved education and the mission of Christian Record. 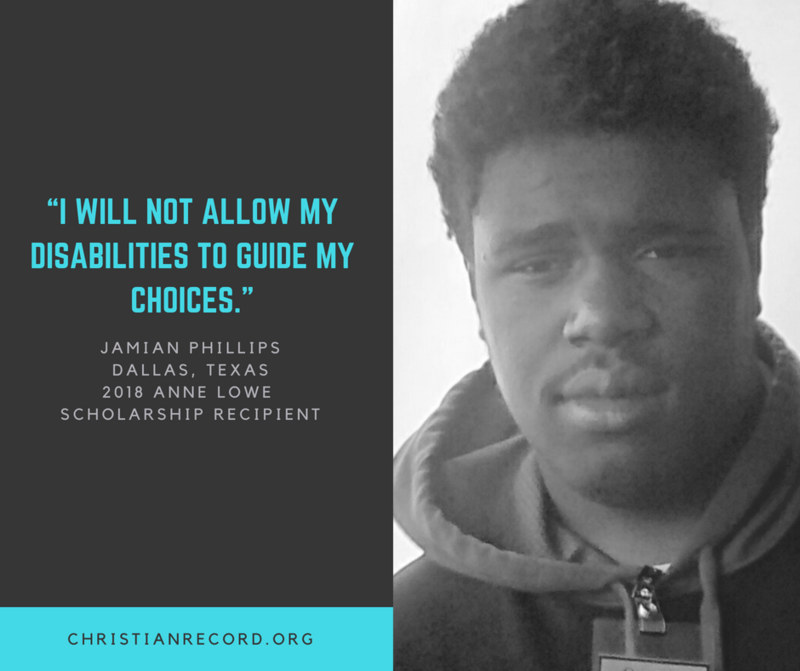 Donors may contribute to this scholarship specifically or arrange to set up an endowment of their own by talking with a professional Development Officer at Christian Record.